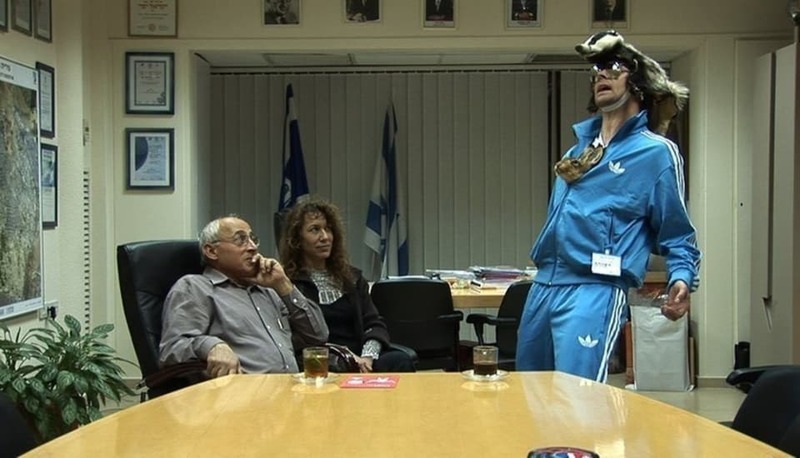 Filmed before the recent incursion into Gaza by Israel, The Plover’s Wing sees Coates performing a shamanic ritual, descending in a trance to the ‘lower world’ to consult animal spirits on a question put to him by the Mayor of Holon, Israel regarding the Palestine/Israeli crisis. The subsequent discussion, drawn from Coates’ interpretation of the responses that he has received from the animals that he has encountered, and applied to the question posed by the Mayor of Holon offers an insight into the wider conflict. interpretation of the answer to the initial question. The ongoing series of performances and shamanic rituals have been made into films and photographs that recall the animal cults of pre-modern societies. Whether dressed as a stag at a gathering of the baffled tenants of a condemned Liverpool tower block or training amateur singers to mimic the dawn chorus, Coates’ work reconsiders the spiritual roles of animals and nature in postmodern society. Through a combination of his earnestness as a Shaman, the absurdity of the Shamanic ritual in a contemporary setting, and his deadpan documentary style Coates inadvertently exposes the structures of society and calls into question the need for a reconnection with our origins. from symphonies by romantic English composers, ( Elgar, Vaughan Williams, Finz Holst...) These final notes combine to form a never ending piece of music.